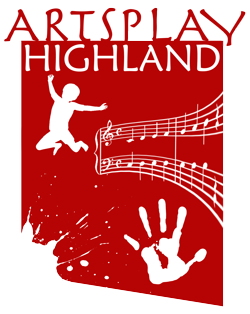 Artsplay Highland Music Matters project for 2015-2016 involved 16 groups of nursery children across the Highlands. Each nursery received 25 weeks of music sessions led by our team of music specialists. The nurseries that took part were: Central, Merkinch, Dalneigh, Limetree Nursery, Park Primary in Invergordon, Tomnacross, Teanassie, Dochgarroch, and the Gaelic nurseries at Dingwall, Drumnadrochit and Craighill in Tain. Each session introduced basic music building blocks in a fun and educational way. Our music specialists helped grow these skills in the sessions through singing, dancing, musical games, free movement to music and playing percussion instruments. Music Matters runs for 25 weeks of the year and this really helps the music specialists to get to know all the children,increase their involvement and help them learn. Singing and music play an important part in our Highland culture. Lots of research now shows that developing music skills at an early age can have a positive influence on other aspects of a child’s education. Our sessions also help to develop each child’s language, literacy, listening, coordination, concentration and social skills. During the sessions, our music specialists actively work to develop the children’s confidence and creativity. In addition to love of music, the sessions nurture crucial skills that children use throughout their education.